PHILADELPHIA, Pa. — Kenworth took time at the American Trucking Associations’ Management Conference & Exhibition to celebrate a “wonderful year” marked by market share growth and the addition of new products. 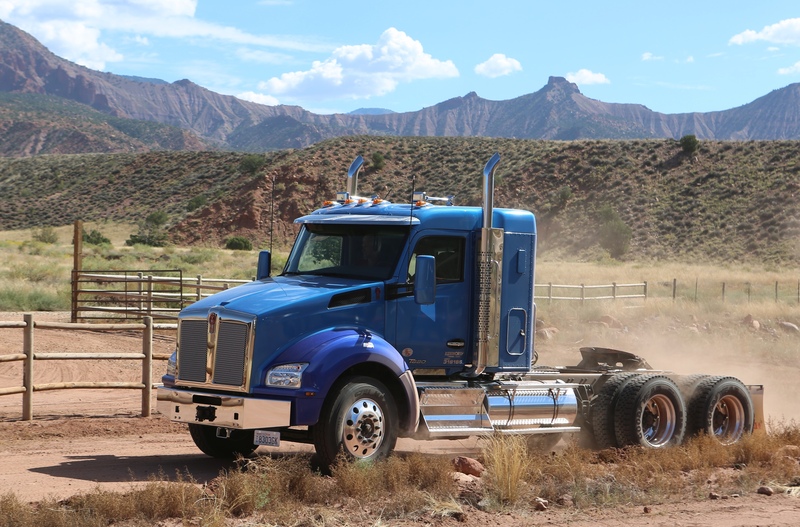 Preston Feight, Kenworth general manager and Paccar vice-president, said Kenworth’s 15% heavy-duty and 8.6% medium-duty market share are both trending towards new records for the company as 2015 winds down. He also said Paccar’s MX-13 now has a 40% penetration rate in Kenworth trucks, which is being validated by customer re-ordering the engine, introduced in 2010, during their second purchase cycle this year. Also this year, the company launched the MX-11 Paccar engine, which will be available in January 2016, its TruckTech+ remote diagnostics platform and a new 76-inch mid-roof sleeper for the T880 and T680. Feight said the new MX-11 offers a B10 life of a million miles, meaning 90% of engines will reach a million miles without needing a significant overhaul. It can be spec’d with 355-430 hp and 1,250-1,550 lb.-ft. of torque. It offers a weight savings of about 400 lbs compared to the MX-13, making it an ideal option for weight-sensitive applications, including LTL, regional, ready-mix and tanker, Feight said. Kenworth also announced availability of a 40-inch sleeper, which will be offered beginning in March 2016. This will reduce weight by 250 lbs compared to the smallest currently available sleeper, Feight said, and is ideal for applications where the driver may be away overnight on occasion. Heavy tow and oilfield services are a couple of the applications that will be targeted. Feight also touted Kenworth’s fuel economy improvements on the T680 achieved over the past two years, amounting to about 10% thanks to enhancements including: predictive cruise control on Paccar and Cummins engines; neutral coast mode; auto start/stop for its idle-management system; wheel well close-outs; optimized chassis fairings; and new T680 Advantage options including day cabs and 52-inch sleepers. Kenworth’s TruckTech+ remote diagnostics platform is now installed in more than 5,000 trucks and Feight said it is proving to be the most user-friendly system in the market. “Right out of the gate, people are saying this system sets the benchmark for how remote diagnostics systems should operate,” he said. Kenworth also announced at the ATA MC&E, a new PremierCare Gold program for dealers that recognizes those that take extra steps to improve service and reduce downtime. “Dealers have to have a focused approach to how they maximize uptime,” said Feight. Some of the requirements include: a PremierCare ExpressLane offering two-hour triage; 24-hour roadside assistance support; a high-end driver’s lounge; additional hours of operation, including on weekends; all technicians must be MX-certified; parts availability must be outstanding; and dedicated personnel must be available to support TruckTech+. “They need to be monitoring fleets operating in their area and know who is having issues so they can jump on those issues as soon as possible,” Feight explained. He said the new program will build on investments Kenworth’s dealer network has already made over the past five years, amounting to about $500 million and an 18% increase in service bays. He said 25 Kenworth dealers have invested more than $1 million into their facilities in the past year. Feight also confirmed for the first time that Kenworth will not participate in the 2016 Mid-America Trucking Show. Now all OEMs have announced their intentions to skip the show except for Peterbilt, which has yet to declare its intentions.